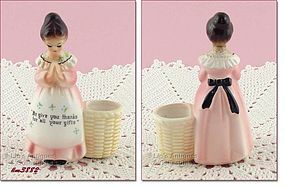 Another lovely Prayer Lady item by Enesco – this one is a toothpick holder! Measures 4 ¼” tall and has the original gold/red foil sticker/label. She is in excellent condition with no evidence of “use”. One corner of her apron has a tiny rough place that is not a ding, just a glaze imperfection. There is also a tiny flake-off that has been glazed over on inner rim of the toothpick “basket” – again, it is production, not from use. Very nice item and a great addition to a collection!